The topic of the game is the building of a Railroad from the Cape of Africa up to Cairo, a task which even in our modern times has not yet been completed. 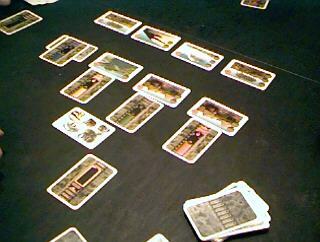 The players take up the roles of different railbuilding companies, each equipped with a starting-capital of 100 Pounds. The first company which will have succeeded in building 8 pieces of track through different kinds of Landscape will have won the game. At the beginning of a round, as many landscape cards as there are players will be available for auction. Apart from displaying a type of landscape (river, mountain, desert etc.) these cards also have a value and a track building capacity. In turn, the players will secretly bid money in order to be the first player to chose from the cards, and once all players have placed their bets these are revealed simultaneously. The player who has paid the highest amount gets to chose his landscape first, and the other players will follow in the order of their bets. The players then place the new landscape in front of their engines, and the railbuilding process will start. Each landscape needs a certain number of rails in order to be crossed, and the number of rails needed increases the more difficult the terrain becomes. In order to get the number of rails needed, the players can take the track building capacity of the landscape into their calculation, but that alone is never sufficient to complete the track through the landscape. Thus, a new landscape-card from the stockpile is revealed and the current player may decide to use the track building capacity of this card in addition the the track building capacity which he already has in order to complete the track through his landscape. This works if the number of tracks meets the number of tracks needed to cross the landscape, and a player also can take additional tracks for a price of 10 Pounds (this is rarely done due to the high price). 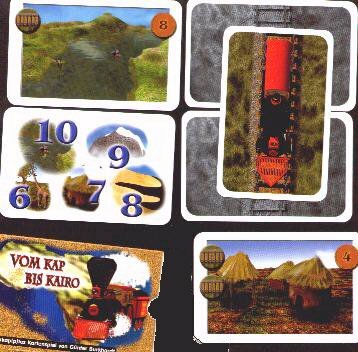 If the track is built through the landscape, the card is turned over to its track side and the train may move forwards, but if the player should not be able to build a track he gives the landscape card which he revealed to get an additional track building allowance to the next player who adds yet another card and then may decide whether he has enough track building allowance to build his track. Rivers are the most difficult landscapes to cross because the players have to meet a high demand of track building allowance, but on the other hand a player who waits in front of a river will get bonus cards whenever other players build tracks. As said before, the first player who succeeds in crossing 8 landscapes wins the game. The game is very easy to learn and play, but it features a very nice playing mechanism and good strategy-options for the players. Especially for a cardgame with a price of only 10 DM the game has an outstanding quality.